From the perspective of an artist, working with hand tools provides a direct connection between an idea of form developed in the brain and the expression of that form in a tangible creation produced through muscle control. Using this concept, the bare hands are also considered a tool. The topic here is hand tools but extending the idea a bit further, any part of the human anatomy can be a tool. For example, a finger nail can be a scraper. There is a distinct dividing of hand tools between powered and non-powered. The importance of this division is often a subject of debate concerning the use of the description of “handmade”. The debate is understandable as descriptions of how product are made should be accurate as to their meaning. For this article, the topic is not a discussion of this classification and defining a marketing term. Simply some thoughts about how a product is made. Hand tools is the general tool classification and powered and non-powered are both considered hand tools. Descriptive modifiers are used to clarify each sub category when necessary. There is a certain “nobility” for the method of creation and the tools used for that creation. It’s a human decision to make and use tools that work faster or easier than what human power alone can accomplish. The reasons for the choices made are complex and infinite. The question is, what effect does primitive methods have in this determination? Personally, I do not take or defend one single position as the only option. I just love to create and make things. The tools are the best I can obtain for the task at hand. Sometimes it is fun to just do things with simple non-powered hand tools because it feels good. What about the spirit? The spirit is the emotion of creation. Hand tools are the shortest and most direct connection to the human basal and primitive spirit of making things. Working directly with the material is a tangible satisfying experience. The artist feels a connection with what is created by hand. A spirt of human intent and physical effort has been combined to produce the result. Considering the human intent, all choices are highly individualistic. What works for one artist may not be important to another. Powered hand tools do not significantly alter the intent. They modify the effort. That’s the purpose of being powered. If the intent is to make a hole, how that hole is made is not always a part of the intent. If the general intent is to not use powered tools then how the hole is made is limited by that defined desire. If the only tool available is a pocket knife, then the hole will likely be made using the knife. It’s true the artistic spirit is diluted when automation removes direct human control. But some automation is almost always an accepted part of the overall creative process. Raw materials can be directly harvested from nature. Today most materials are gathered and processed by automated machines. For example, today few oil painting artists gather, grind or process their own pigments. The spirit of hand tools is not in the tool its self. It is created by the involvement of the human to use the tool whether it is powered or not. It is the direct personal action in control of the tool to modify the material or appearance of what is being created. To that reasoning the amount of effort required doesn’t change the intent. Powered tools make it easier or faster. Which is “better” can be debated but the intent is the same. I like using manual tools. They are up close and personal. That doesn’t hinder me from picking up a powered hand piece with a bur, to quickly remove excessive material or make a hole. The creative spirt was not affected, only the time and effort required. That’s no sin in the mind of this creator. If it is for others, it is not a concern of mine. Choosing and using powered hand tools is a personal experience. Some power tools are simply turned on and operated. But when a user can pick one up and hold it, and has immediate manual hand control of its results, it is a direct extension of the user’s mind. The creative spirit moves past the power assist. Working directly with hand tools is not the only creative process. I thoroughly enjoy design and creation using Computer Aided Design (CAD) and Computer Aided Manufacturing (CAM). They are combined using Computer Numerical Control (CNC) to control a tool that creates a tangible result. Definitely not a hand tool in the sense described here. The spirit of the human physical touch and muscle control are not present. The essence of human intent and design remains. That is still a powerful result. The intent in my automated work is the detail and perfection available through the precise definition of movement created using these tools. The results are repeatable but the intent is not for soul-less product reproduction in a factory. The outcomes are solely from the personal efforts of my creative designs. Lacking only is the variable and subtle difference of a finish produced with true human hand tooling. Fuzzy Logic could be programmed into CNC to simulate human variation, but for what purpose? Only to fool the customer, perhaps. As an artist, the joy is in using real tools and building skills using them, not faking the appearance of using hand tools with computer automation. Sorry for this long post — no need to reply! I am a professional musician, so I fully appreciate “hand work,” but I’m also in situations where we make recordings — even on stage, it sometimes feels like we should be wearing white lab coats. It’s tricky to balance so-called perfection with powerfully expressive performance, even if the intonation is smudged on occasion. There’s a piano competition in which the contestants perform on a Yamaha Disklavier. This instrument captures all of the performance data as machine-readable MIDI files. It’s very interesting to see how much “imperfection” is contained in those beautiful performances when you open the MIDI files in Excel! When quantified in this way, we realize those “imperfections” are the _precise_ data of musical expression, not capricious human variation. And it is quantifiable. In principle, a knowledgeable programmer could enter the data directly on a laptop and have a Disklavier play it. It’s not very efficient — in fact it’s more cost-effective to hire skilled musicians, like Gershwin making piano rolls — if those musical qualities are still considered valuable. Pye (who was a superb craftsman) avoids the moral baggage that comes with arguments about hand-craft versus machine-craft. 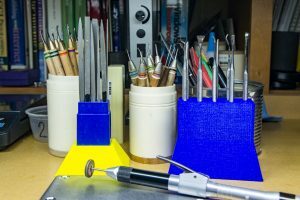 He instead speaks of the “workmanship of risk.” This situates any operation or technique, whether executed with fingers or a CNC machine, in a continuum defined by the degree of risk entailed in the operation. It’s a neat formulation.